In contrast to a proportionally spaced font a the characters in a monospace occupy all exactly the same width. 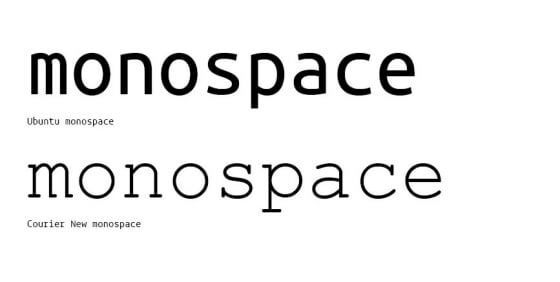 In the past monospace type was used on typewriters, and more recently in some specialised printing environments such as Credit Card embossing, or ticketing. Today, monospace fonts are primarily used within a programming environment working on terminal windows. The monospace font answers the need for clear code structuring and predictable line lengths. Using monospace fonts allows the programmer to immediately spot a mis-typed character or double space, any of which would prevent the code from compiling as expected. The new Ubuntu Mono in a code enironment. Courier is probably one of the most widely recognised monospace fonts, available on many computers. Its pitch sits at 12 glyphs per inch, set at 12 point. Based on an em-square of 1,000 units this is equal to 600 font units. As Courier is widely used it must be considered as a baseline for new monospace designs. When starting the work on Ubuntu Mono we soon felt that we could narrow the pitch and thus increase the character count per line without compromising legibility. Only a few other monospace fonts have departed from the Courier pitch, amongst them Consolas available in the latest Clear Type collection from Microsoft. We carried out numerous trials to establish the right pitch width for Ubuntu Mono and arrived at 560 unit width. The narrower pitch also helped with spacing of the font as many characters tend to have too much space on the left and right, locking the lowercases together for enhanced legibility. Naturally, the narrower width does create a conundrum on some wide characters such as ‘m’ and ‘w’ but we are confident to have found an acceptable compromise. Of course, as the font weight gets bolder the narrower width does create a number of design challanges, even more so with the critical characters mentioned above. 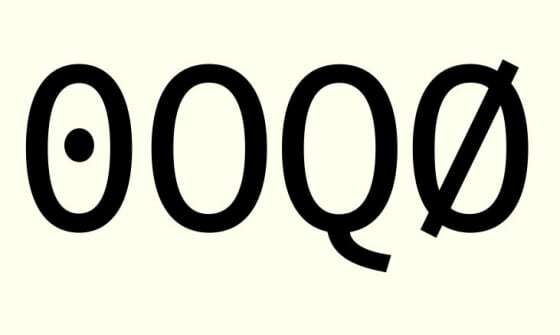 But the tighter density of the type allows the type designer to compensate by reducing the stroke width of the characters compared to the proportionally spaced font, without deacreasing colour texture, or contrast against the Regular. The biggest difference between creating a proportional font and a monospace is that a proportional design allows the designer to draw the glyph in harmony within itself and agains the other glyphs. 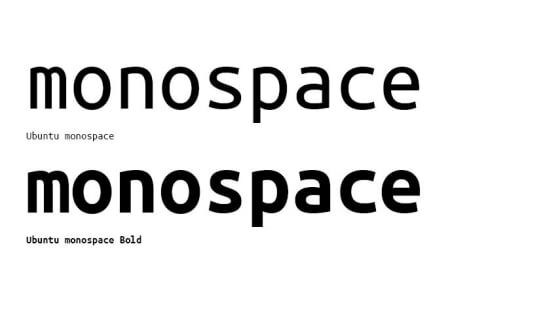 A monospace design is dictated by the width and side-bearings (space to left and right of glyph) leaving the designer challanged to find creative solutions to maintain harmony. A number of alternative designs to solve the problem of the ‘m’-density. Sometimes we just have to live with a compromise. The monospaced fonts are planned to be part of the next Ubuntu release in Spring 2011 after being exposed to extensive testing. This is to ensure that they meet as many needs as possible, and being aware that it will be used primarily within a coding environment our emphasis will be to create it with this user group in mind. The dot within the zero helps to distinguish this glyph agains both the O and Danish Oslash.